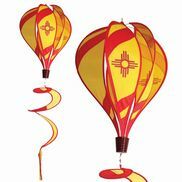 Animated Kinetic Hot Air Balloons are eye-catching and fun. The hot air balloon shape is made to catch the breeze and spin. 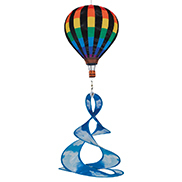 When the balloon rotates, the dye-sublimated printed graphics are designed in a way that makes them appear to move! 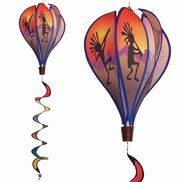 The Kokopelli Hot Air Balloon comes complete with a color coordinated curly tail.